Originally posted 3/28/2012. Updated 7/28/2018 to include comments by the Montserrat Guide which were previously in a separate post. We just got back from a vacation tour of Spain. What a beautiful country! Lots of energy and activity everywhere we went. But, they are going broke. They share bottom spots in the European economic lineup with Greece, Portugal, and Ireland and are probably going to need a significant bailout. Total unemployment is around 23%, and 50% for youth under 25. Government spending is being drastically cut, and a general strike is scheduled for tomorrow, March 29, in protest of those cuts. I have frequently commented on the futility of using small European countries such as Norway, Austria, and Finland, with small and homogeneous populations, as models for how the United States should manage health care, education, welfare, and the tax system to support those programs. Spain is not such a country. It is more like our own, with a diverse population resulting from centuries of invasion by waves of Phoenicians, Assyrians, Carthaginians, Romans, Goths, Visigoths, North Africans, and Middle Easterners, and by restricted communication and loose political ties among regions separated by mountain ranges, rivers, and language differences. Even today, there are four regional languages in the country. And, in spite of a reputation of 800 years of peaceful co-existence of Muslims, Christians, and Jews under Muslim rule, Spain has never been a model of harmony and tolerance among diverse peoples. It is unfortunate that many of the past struggles in Spain are described as religious, Catholics vs. Muslims, when the true motivation was normally territory acquisition. For Muslims, religion and state are one, and the Emperor Constantine moved the west pretty far in that direction when he declared Christianity the official religion of the Roman Empire. And while it may be that when Catholics had the upper hand, they would often tolerate Muslims and Jews in return for payment of tribute and when Muslim forces had the upper hand, they would often tolerate Catholics and Jews in return for such payment, such tolerance was far from full acceptance resulting in harmonious living. The Jews, of course, never had the upper hand and were always dependent on toleration for survival. And, since territory was the most fundamental issue, Catholics sometimes fought Catholics, Muslims sometimes fought Muslims, and Catholics and Muslims would join forces to fight either Catholics or Muslims or other alliances. That period of Catholic-Muslim turmoil lasted 800 years from the first invasion of the Iberian Peninsula by North Africans in 711 C.E. 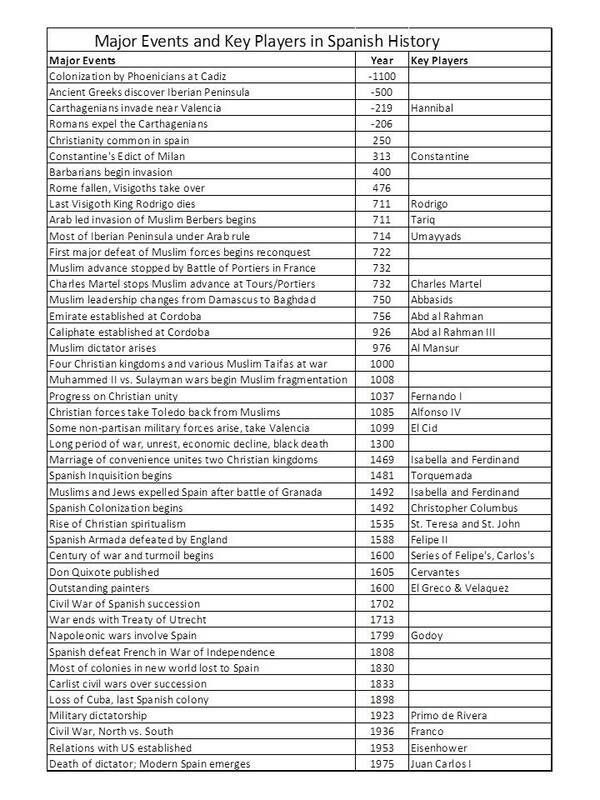 until Ferdinand and Isabella defeated and expelled the last Muslim community, Granada, in 1492, even while Columbus was spending their money in the New World. Expulsion of Jews and Muslims after 1492 was followed by the Spanish Inquisition which sought to test, through torture, the sincerity of those who had chosen to convert to Christianity rather than leave. Then there was war with England and defeat of the Spanish Armada, a civil war in the 1700’s, Napoleonic Wars, the Carlist Civil War and even in the 20th century, three years of civil war costing 1.2 million lives and leaving General Franco in place as Military Dictator for almost 40 years. He died in 1975, after which the seventeen regions of Spain began emphasizing autonomy. It has been a tough journey. He went on to say that no provision was made for the families of the people imprisoned. They just had to do the best they could with meager resources. Freedom isn’t free, and we must remember, treasure, and defend our Constitution and Bill of Rights. In spite of economic difficulties, Spanish infrastructure seems to be in excellent condition. High speed trains are running. Cities are beautiful and architecture is impressive. It is strange that a country with Roman walls and aqueducts still in place can look and feel so modern and clean. And the restaurants with excellent food and packed with customers are everywhere. As our tour leader said, the Spanish people are still enjoying their lives with good friends and good food in spite of all the difficulties. Below is a summary of major events in Spanish history. Long live Spain!